The Obama White House decided last week to double the number of American “trainers and advisers” in the fight against the Islamic State; bringing the total number of US military personnel in the campaign in Iraq to 3,000. The United States has been conducting airstrikes for three months now, with little to show for it. US warplanes, reported the paper of record, “are mostly hitting pop-up targets of opportunity.” In Iraq, only a quarter of more than three thousand sorties so far involved striking targets on the ground. The situation in Syria is even worse. After the initial strikes on obvious fixed sites clearly visible from the air, the campaign has petered down due to lack of targeting information. This comes as no surprise, given that there are no partners on the ground to direct fire. What the United States is doing in the campaign against ISIS amounts to a controlled experiment. What is being tested is the “Afghan model” of warfare, in which indigenous allies replace US ground troops with the help of American air power and a small number of special operations forces. The rapid collapse of the Taliban alliance in 2001 was explained by the devastation wrought by US precision strikes allowing even a rag-tag crew of local allies to take-over territory abandoned by the Taliban. Specifically, special operations forces acted solely as scouts tasked with providing precise locations of enemy positions which would then be annihilated by precision airstrikes. Once the enemy had thus been routed even untrained indigenous ground troops could be expected to prevail against survivors. Obama’s current war plan to “degrade and destroy” the Islamic State essentially amounts to a bet on the viability of the Afghan model. The governing logic of this nonlinear relation between airpower and the balance of skill on the ground relies on the lessons of 1918, laid out in Biddle’s excellent monograph. The deadlock of the Western Front remained unbroken for more than three years. Massed infantry tactics in 1914 yielded nothing but slaughter in the face of modern firepower. In 1915-1918, all armies instead first used artillery barrages to dislodge the enemy from dug-in positions, followed by infantry charges to take-over territory. Such effort usually failed outright because even a few survivors armed with modern weapons could still slaughter a painfully large number of exposed troops as they charged the trenches. Even when such tactics allowed one side to advance a few hundred yards, it increased their exposure to the enemy’s artillery. How, then, could men survive the storm of steel and advance at all? The solution that was hit upon by all (surviving) great powers was essentially the same. Germany (as usual) was the first to innovate with the Second Battle of the Somme in the first of the four Spring Offensives in 1918. Instead of massed infantry brigades, troops advanced in dispersed small platoons that were less vulnerable to concentrated fire. They moved at speeds afforded by the terrain, using all possible cover to shield themselves from the hail of fire. Artillery was deployed not to dislodge the enemy but to momentarily suppress enemy fire to allow one’s troops to dash across open fields and into the safety of cover. This required combined arms operations with close and unprecedented cooperation between multiple units. These innovations, quickly deployed by all powers still fighting, finally restored movement to the Western Front in 1918. Biddle calls the complex of techniques required to operate effectively in the face of radically lethal modern weapons, the “modern system.” His basic argument in that military power in the modern era is not just a function of material capabilities and technology. Numerical preponderance is such a bad predictor of military outcomes that even flipping a coin performs better. Nor do more sophisticated measures of material capabilities like the Composite Index of National Capability (CINC), also called the COW index, does much better in predicting military outcomes. Rather, a state’s effective military power depends first and foremost on whether or not, and to what degree, it has mastered the modern system of force deployment. Biddle shows how military contests between modern and non-modern armies have been extraordinarily one-sided, whereas numerical preponderance and technological advantages only matter in wars between like armies. Biddle oversells his case for continuity in land warfare since 1918 a bit in that the introduction of the radical combination of mobile armor and flying artillery in 1940, and the emergence of precision guided munitions in large numbers by 1990, were indeed game changers. By his own account, the French military had learned the lessons of 1918 and adopted the modern system of force deployment. How, then, was the Fall of France accomplished in six short weeks? As for the effect of precision guided munitions and ISR (intelligence, surveillance, and reconnaissance), one only needs to examine the discussions of Russian, Chinese, and Indian military strategists. Still, on the specific question of the campaign to destroy the Islamic State, Biddle’s insight is clearly applicable. The caliphate is not simply a rag-tag collection of salafi jihadists. It reportedly contains a very large number of former members of the Iraqi army, including the highly-trained Republican Guard. (The Iraqi army was helpfully disbanded by Paul Bremer in his de-Ba’athification of the Iraqi government in 2003.) Moreover, we have seen that the Islamic State is capable of complex operations. It has prevailed against Western and Israeli-trained Kurdish peshmerga, as well as the strikingly numerically preponderant US-trained Iraqi forces, not to speak of Assad’s forces and sundry rebel groups in Syria. 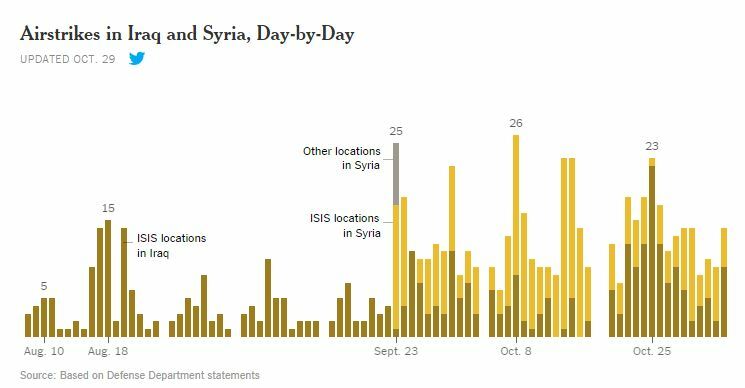 At one point, the New York Times article says that the airstrikes have forced ISIS fighters to “disperse and conceal themselves,” counting it as a success. But it could equally well be seen as a signal warning that ISIS is learning the modern system of force deployment, if they are not already trained to do so. For it is not out of the realm of possibility that they are being trained by elite Republican Guard officers who were the only ones to put up a serious fight against invading US forces in 2003. It recently surfaced that the Islamic State has acquired a number of advanced surface-to-air missile systems. ISIS has used heat-seeking missiles to down Iraqi helicopters. It recently published an online guide describing how to use shoulder-fired missiles to down Apache attack helicopters. The US has refused to deploy these otherwise very effective platforms because of worries about their vulnerability to ground fire. Fixed winged aircraft, whether manned or drones, can provide air cover only for brief, intermittent periods. The adversary can seek cover when they hear the warplanes approaching, and resume their movement after they pass. Survivability rates for trained adversaries on the ground are thus very high, even in the face of an intense air campaign. At lower altitudes such as during take-off and landing, even fixed-winged aircraft are vulnerable to the aging Soviet-made SA-7 Manpads, which has been used often enough by ISIS and other insurgent groups. ISIS positions close to the Baghdad airport are thus a special headache. ISIS militants may also have gained access to Chinese-made FN-6 missile systems, and even the more advanced Russian-made SA-24 Manpads which are effective against aircraft flying at cruising altitudes. Not only are ISIS fighters well-trained and well-armed, they are also learning how to operate in the face of US airpower. The Kurdish peshmerga and Iraqi troops are therefore unlikely to prevail against the Islamic State even with the support of US airpower. The United States’ controlled experiment is likely to fail. America will eventually have to place substantial boots on the ground. The plan put forward by Kimberly Kagan’s shop, the Institute for the Study of War, is sound. It calls for the deployment of 25,000 combat troops. That number will keep rising the longer Obama takes to realize the futility of the experiment. 1. Andres, Richard B., Craig Wills, and Thomas E. Griffith Jr. “Winning with Allies: The Strategic Value of the Afghan Model.” (2006). 2. Biddle, Stephen D. “Allies, airpower, and modern warfare: The Afghan model in Afghanistan and Iraq.” (2006).